Azusa has selected an extremely tough steel for their high quality Deluxe Flexpruf Axles. 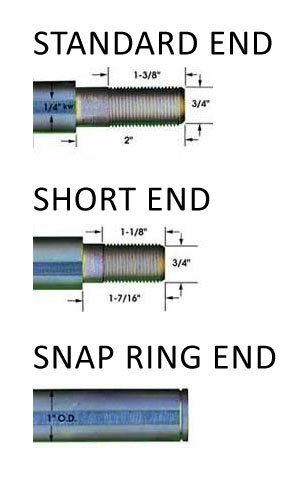 The ends step down from 1" to 3/4" and have a 3/4-16 thread. Two keyways (1/4") are offset 180 degrees for stress relief, balance and unrestricted positioning of brakes, bearings and hubs. Ends are drilled for your cotter pins or safety wire. 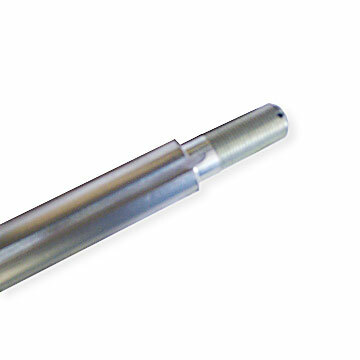 Q: Is the keyway the entire length of the shaft aside from the threaded ends? Q: what bearing should i use with this. the axle that i have now has a three bolt flange ? Q: I purchased this axle a bit early in my project and i started thinking, what size wheels can i use on it? Wheels with a 3/4" bore or a 1" bore? if i can only use wheels with a 3/4" in bore then how will I use the keyway? or if I use wheels with a 1" bore, how will i tighten them on? would i need to use wheel hubs? i am a new kart builder and im just a bit confused. If you could explain to me the mounting process of the wheels to this particular axle, that would be fantastic. Deluxe Flexpruf Steel Solid Axle - 1"